Facing adversity is hardly anything new for the Chicago Bulls. So perhaps as they prepare for Friday’s Game 3 in Washington D.C. facing a 2-0 deficit, they are as equipped as any team to respond with a victory. As for how the Bulls will rise up to the challenge after coming up short in a pair of games at home, their hope is that consistency is the key. Averaging 10.5 points, 7.0 rebounds, 2.0 assists and 2.00 steals in 48.4 minutes through two postseason games, Butler’s scoring is down slightly from the regular season but Thibodeau applauded him for making the right plays this series. 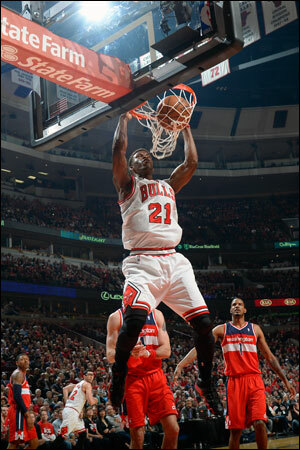 Butler played a playoff career-high 53 minutes in Game 2 on Tuesday. He said on Friday he feels good physically and he’s ready to go. He’s more concerned with being productive on both ends of the floor. Known for being a defensive-minded player, Butler wants to try and be more aggressive offensively as the series continues. While obviously an 0-2 start is not what the Bulls envisioned as the postseason began, players say their confidence is intact and spirits are up. “The mood is great. The mood is exciting. The mood is guys feel there’s an opportunity to go out there and shock the world basically,” said Taj Gibson. As for Thibodeau’s message to his team, he kept it simple. Come prepared, pay attention to the little things, make the extra effort, and yes, do it all for 48 minutes. It’s an us against the world mentality that the Bulls have adopted, explained Butler. But again, that’s nothing new for this team.